The Twenty-fourth Amendment (Amendment XXIV) of the United States Constitution prohibits both Congress and the states from conditioning the right to vote in federal elections on payment of a poll tax or other types of tax. 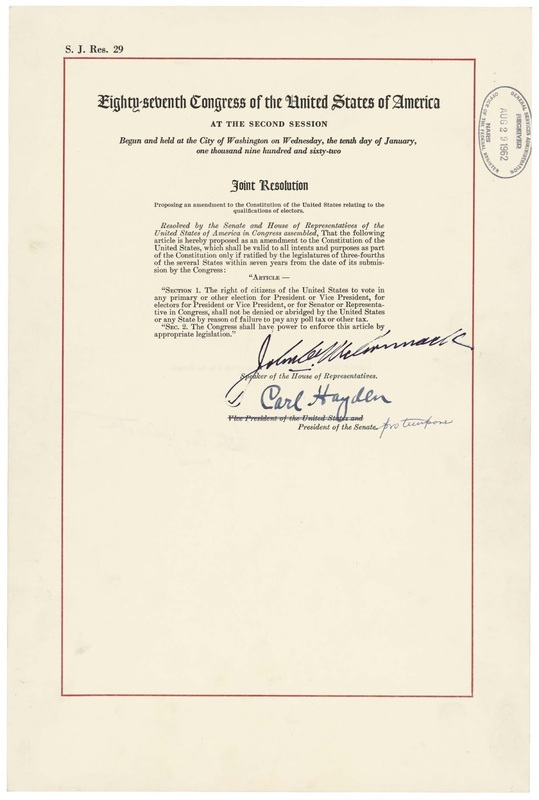 The amendment was proposed by Congress to the states on August 27, 1962, and was ratified by the states on January 23, 1964. Southern states of the former Confederacy adopted poll taxes in laws of the late 19th century and new constitutions from 1890 to 1908, after the Democratic Party had generally regained control of state legislatures decades after the end of Reconstruction, as a measure to prevent African Americans and often poor whites from voting. Use of the poll taxes by states was held to be constitutional by the Supreme Court of the United States in the 1937 decision Breedlove v. Suttles. When the 24th Amendment was ratified in 1964, five states still retained a poll tax: Virginia, Alabama, Texas, Arkansas, and Mississippi. 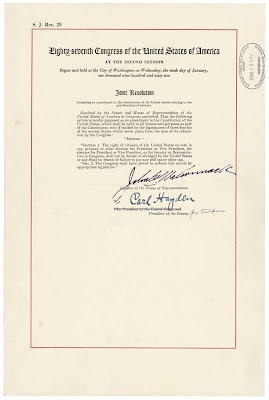 The amendment prohibited requiring a poll tax for voters in federal elections. But it was not until 1966 that the U.S. Supreme Court ruled 6–3 in Harper v. Virginia Board of Elections that poll taxes for any level of elections were unconstitutional. It said these violated the Equal Protection Clause of the Fourteenth Amendment. Subsequent litigation related to potential discriminatory effects of voter registration requirements has generally been based on application of this clause.